January 2016. The best solar research results are of little use if they don't reach the intended users. 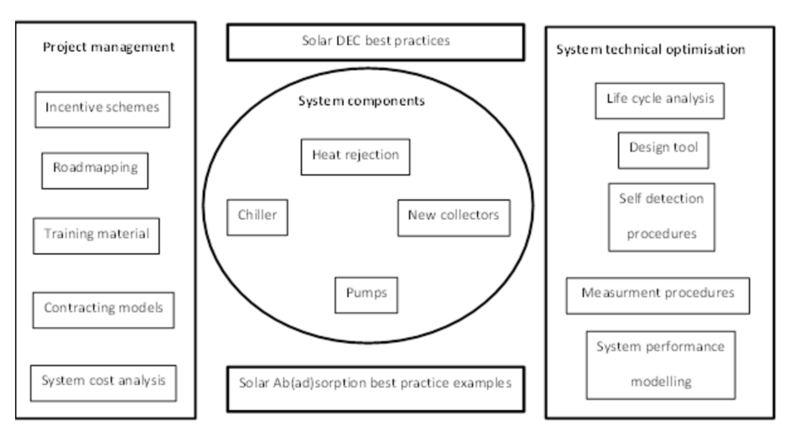 To make this link easier, IEA SHC's project on Quality Assurance & Support Measures for Solar Cooling Systems created the diagram below to categorize the results from 3.5 years of work by 30 solar cooling experts. Publications on system optimization (right). Each keyword in a category links to a document, a study, a best practice brochure or an Excel tool for system design. The Results Diagram can be found on the IEA SHC Task 48 homepage. Below are a few more highlights of the Task 48 diagram; the bold headlines correspond to the links in the Results Diagram. Roadmapping: Guidelines for drafting a roadmap on solar cooling includes recommendations based on the analysis of available solar heating and cooling roadmaps. Solar ab(ad)sorption best practice examples: A total of 12 solar cooling projects and their monitoring data are described in detail in the best-practice brochure. Design tool: Computer-based pre-sizing tool Pistache for cooling, heating, and domestic hot water production was developed by French experts, and to data, downloaded more than 1,500 times. 20 countries, the European Union, and four organizations are IEA SHC members.